Antigua and Barbuda is a state that includes the islands of the same name and several other islands in the Caribbean. The country is located not far from Puerto Rico. The population of Antigua and Barbuda is small - about 103.3 thousand people, however, a lot of voice traffic is generated here, because the islands are popular as a tourist destination. With a competent approach to doing business in GSM termination, you can earn at least $ 200 here (from each gateway channel). State-owned mobile service provider iMobile has a small subscriber base, while Flow and Digicel are market leaders and compete with each other. Each owns about half of the total number of mobile customers. Many local residents have two SIM cards, which contributed to the high mobile penetration rate - 194% (approximately 180.6 thousand connections). 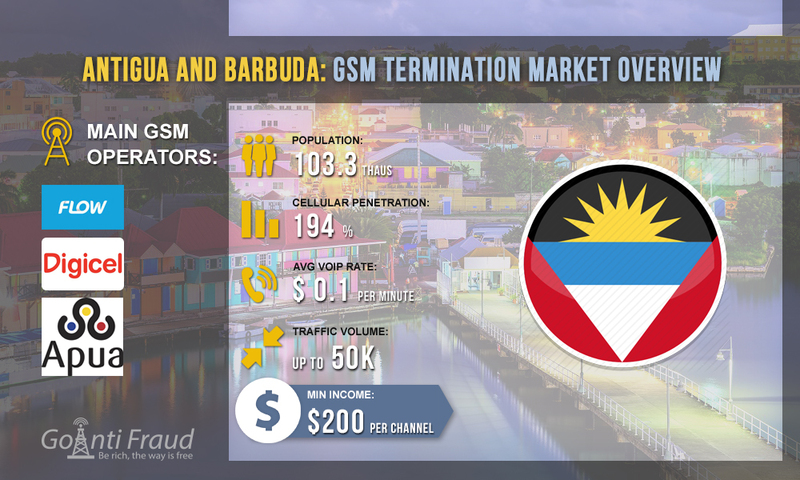 New SIM-cards are quite expensive in Antigua and Barbuda - their cost varies from $7 to $18. At the same time, local cellular communication is quite cheap, in relation to the average rate in this direction (about $0.1 per minute of conversation). Using the multichannel voip gsm gateway uk, a terminator can make excellent money in this country. The minimum income from the channel is $200, but when working with a large number of ports, profit increases significantly.